President Michelle Bachelet declared the massive blaze threatening the city — whose historic center is a protected Unesco heritage site — a disaster zone, permitting the armed forces to step in. This land has some connectivity to the Inca civilization and was in news in Feb 2010 for the devastating earthquake that occurred off the coast of Maule region rating 8.8 on Richter scale and lasting upto 90 seconds. It is also the land when thousands of years ago, migrating native Americans settled in fertile valleys and coastal areas. Earlier the whole World was concerned about the lives of miners in this South American coastal country lying between Andes Mountains and Pacific ocean. Mining sector is one of the pillars of its economy and copper experts alone stands for more than one thirds of its income. You might also know Odyssey, a Greek epic – the story of Odysseus (Ulysses) long journey of ten years in reaching back home after fall of Troy. It is Chile, officially the Republic of Chile which borders Peru, Bolivia, Argentina. Valparaíso is a city, port, and commune of Chile. Although Santiago is Chile's official capital, the National Congress of Chile has met in Valparaíso since 1990. The earlier incident referred was the harrowing times of 33 miners trapped approx 2300 ft below ground when the roof of San Jose copper gold mine in Chile collapsed in Aug 2010. Now there are varying reports of the casualties and no. 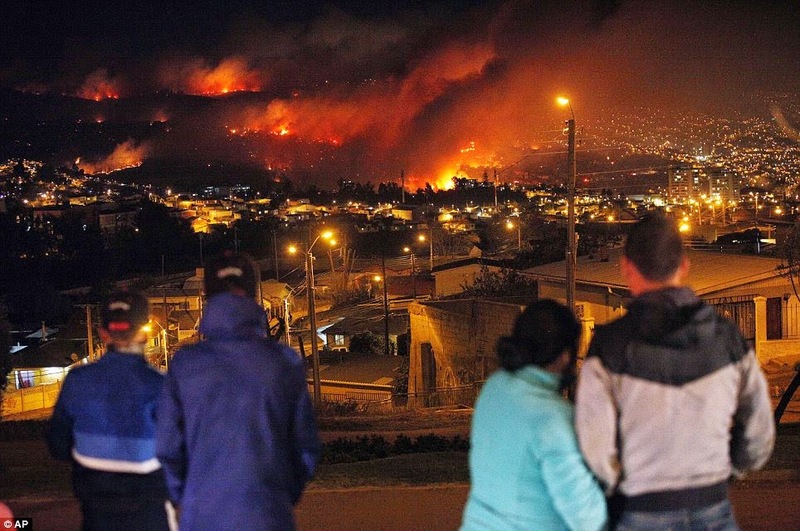 Of houses destroyed ..... between 4 to 11 lives; close to 1000 houses destroyed ~ and thousands of people evacuated after a devastating fire rummaged Chile, now declared a 'catastrophe zone' by country's president. 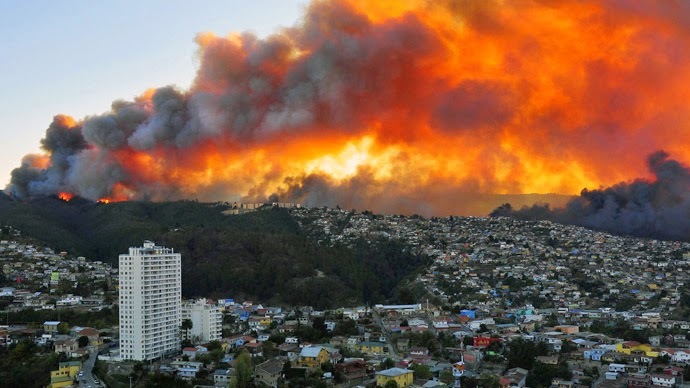 Daily Mail, BBC and many other news channels report that huge fire started in Valparaiso, a coastal city 75 miles from Santiago. The armed forces have been called in to maintain law and order in the city while thousands of people were evacuated. Reports state that huge numbers of homes - many in the steep hills around the city itself - as well as a women's prison were emptied of their residents in a bid to save them from the destruction. Firefighters were having difficulty combating the blaze because of the topography of the city, which is surrounded by dozens of steep hills where most people live. President Michelle Bachelet has declared the city a catastrophe zone, which allows the army to step in and take charge of the evacuations. 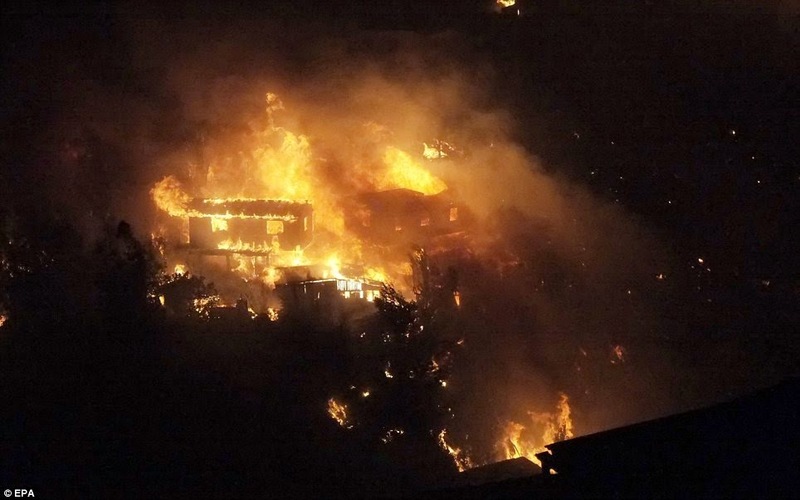 Ricardo Bravo, the area's regional governor, called the blaze 'the worst disaster ever seen.' Thick clouds of smoke surrounded the city's prison and nine pregnant inmates were transferred to a detention facility in the nearby city of Quillota. Prison authorities were evacuating another 204 female inmates to a sports arena. The remaining 2,700 male inmates will stay at the prison for the time being, prison guard commander Tulio Arce said. While firefighters, police and forest rangers battled the blaze, Chilean marines in combat gear patrolled streets in the city to maintain order and prevent looting. Valparaiso, about 120 kilometers (75 miles) northwest of the capital, Santiago, is home to Chile's national legislature. A wildfire also called forest fire is an uncontrolled fire in an area of combustible vegetation that occurs in the countryside or a wilderness area. A wildfire differs from other fires by its extensive size, the speed at which it can spread out from its original source, its potential to change direction unexpectedly, and its ability to jump gaps such as roads, rivers and fire breaks. Wildfires are characterized in terms of the cause of ignition, their physical properties such as speed of propagation, the combustible material present, and the effect of weather on the fire. 13th Apr 2014 @ 08.45 pm. Photo credit : Daily Mail & other news channels.